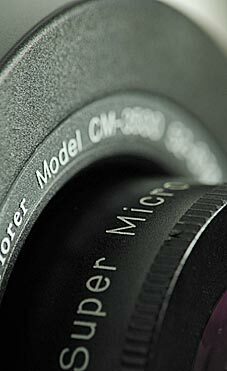 Explores the world of MACROPHOTOGRAPHY with your SLR 35mm camera or Medium format camera. The MacroExplorer lenses are made to be used with any 35mm SLR camera interchangeable lenses in the range of 50mm to 300mm focal length. The MacroExplorer lenses work just as well on medium format SLR camera. 72mm and 77mm adapter rings are optionally available for this purpose. The both 1,5x & 2,5x Macro lenses are designed with large apertures for max. light transmission. Wide-open apertures mean fast enough speeds, even on overcast days. Why Two Macro Lenses ? 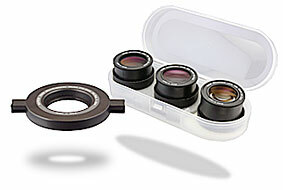 Two lenses are supplied to make available a full range of magnification. The lenses yield reproduction ratio from 1:4 (0.25x) to 2.7:1(2.7x) including the popular macro ratio of 1:1(life size on the film). Your key to an undiscovered world of beauty and fascination. Macro photography captures your subject at or near its actual size on the negative (termed 1:1 or 1x). Conventional means for accomplishing this require expensive and complicated equipment. The 35mm MicroExplorer system allows you to simply snap the 6x or 12x lens onto your zoom lens and immediately discover the intricate detail present, but often overlooked, in everyday objects. You will expand your photographic horizons in ways you may never have imagined, and your photograph will come alive with a wealth of undiscovered beauty. Imagine being able to view and capture the microscopic world that exists, unseen, all around you. No expensive microscope or complicated camera adapters are necessary, just the 35mm MicroExplorer and your telephoto zoom lens. You will be thrilled to discover the majestic microstructures present in all sorts of materials found in your home and nature. And the educational and scientific applications are endless. A blade of grass, a drop of water, even a sprinkle of salt all becomes fascinating new territories to explore and photograph with the RAYNOX 35mm MicroExplorer system.